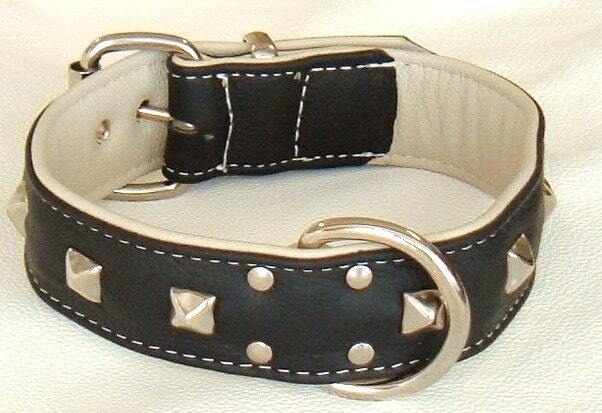 Here we have our hand crafted Black on cream leather studded dog collar with white stitching. Very beautifully made! Came quickly! Great shop! Thank you! Absolutely lovely collar! Had so many problems with 16" collars simply being too big for my dog even though his neck measurement is 13"! Contacted Nanucks Forest Crafts & received helpful, friendly advice & a willingness to make the collar to fit! Couldn't be happier! Well made, great quality & great service! Would highly recommend this seller! Beautiful collar. The leather is so soft. Looks adorable on our bulldog. Very fast arrival, especially considering the collar was handmade when we ordered it! Highly recommend this seller!